Full programme below, and at http://romanticillustrationnetwork.wordpress.com/events/, where all abstracts will be posted in advance of the event. By the pricking of my thumbs, something satirical this way comes. Thomas Rowlandson originally produced this print, along with another caricature entitled Irish Howl for the second volume of the complete Anti-Jacobin Review and Magazine, or, Monthly Political and Literary Censor in 1799. The prints were originally issued in colour, with Irish Howl appearing as the magazine’s frontispiece and A Charm for Democracy being placed in the binding between pages 113 and 114. A second and much smaller run of volume two of the Anti-Jacobin… was then also produced with coloured plates and for some reason the running of the caricatures was then reversed, so that A Charm for Democracy now appeared at the front of the binding. The print shown here is one of those from the much rarer coloured edition. To crush the sense of ages. Eat you heart out, Simon Heffer. The image is set in the interior of the ‘Cave of Despair’ where a trio of radical pamphleteers are in the process of brewing a spell to conjure up a British democracy. The potion contains a contribution from all of the Whig MPs who can be seen eagerly lining up on the left-hand side of the plate, it is garnished liberally with “streams of royal blood” and fired by sheaves of radical pamphlets. The proceedings are overseen by Satan himself, whose demonic hordes also lend a hand in bringing the simmering cauldron of seditious dissent to the boil. 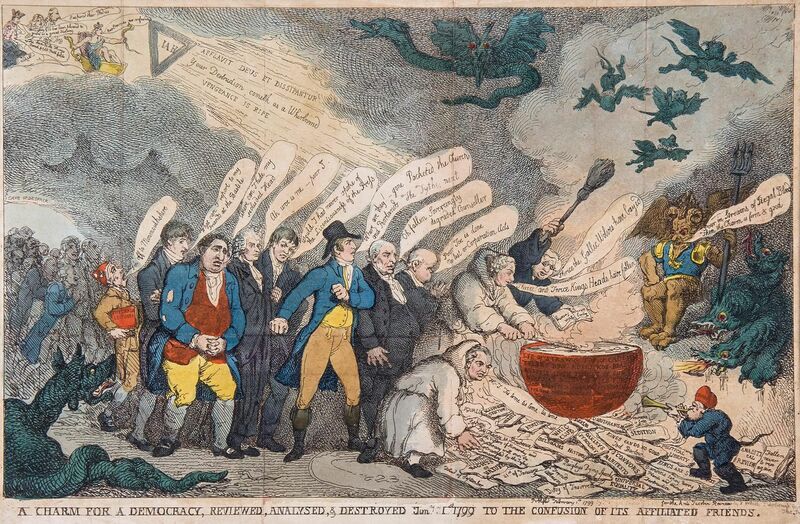 Britain’s only source of salvation from the horrendous prospect of government by the people, for the people, is presented in the form of the King, the Prime Minister and his Tory ministers, who are portrayed in the top left-hand corner of the image, accompanied by a divine ray of light which carries the motto ‘Afflavit Deus et dissipantur’ (‘God sent forth his breath and they were scattered’). A stern reminder that one’s place in society was determined by divine providence and therefore to seek to overturn the settled order of things was an affront to God himself. 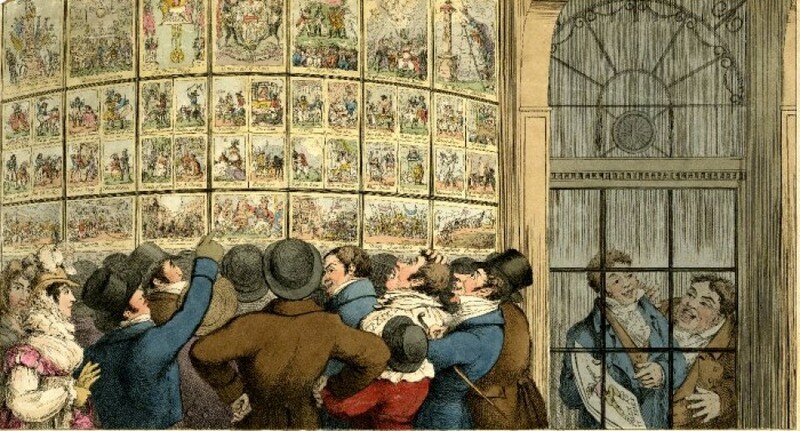 Rowlandson’s own political views are not known. He had famously produced caricatures for both the Whig and Tory candidates during the hotly contested Westminster election of 1784 and therefore seems to have preferred to suspend his own political conscious in the interests of keeping a roof over his head. His most recent biographers have also suggested that he may have deliberately eschewed political satire in order to avoid alienating himself from the wealthy Whig and Tory patrons who purchased his watercolours. However, it does seem hard to believe that an artist with such a profound fondness for titillating humour and unabashed eroticism, could have been seriously committed to the sort of dusty conservatism that was advocated by the Anti-Jacobin Review.